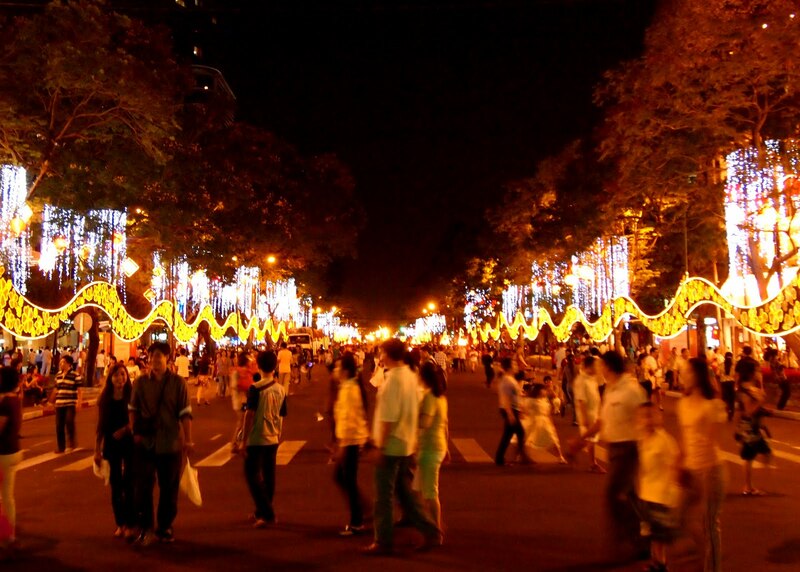 The streets of Saigon have been eerily quiet the past couple days. Most of the city's residents have gone to their hometowns and the ones that have stayed are busy eating and drinking with their families in their houses. I headed out to District 1 on New Year's Eve to see downtown after dark. 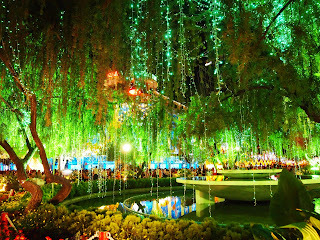 Although the exteriors of the city's landmarks are usually lit up in the evenings, they seem even more exquisite now that Saigon has been illuminated with twinkle lights. Twinkle lights drape trees, windows, and telephone poles throughout District 1. 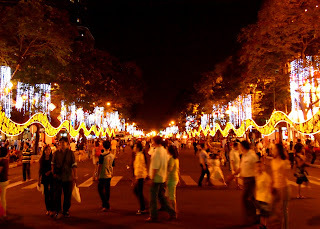 I spent a few hours walking around the district, as the roads were blocked off to traffic for the festivities. It was nice not having to worry about being flattened into a pancake by the motorbikes. Every now again, I would follow the sounds of drums and symbols to find performance troupes at the entrances of the upscale hotels. From performing lion dances and intricate drum numbers to scaling large poles and showing off gymnastic feats, the troupes were well prepared. 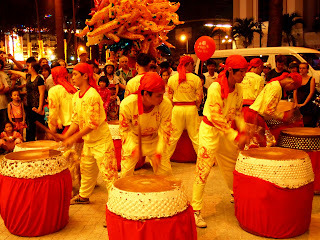 I was told that the performances were paid for by the hotels, as they ward off bad luck and welcome good business for the upcoming year. The iconic Rex Hotel displays a lit up "Happy new Year" message on its facade. Drummers perform a number in front of the Caravelle Hotel. 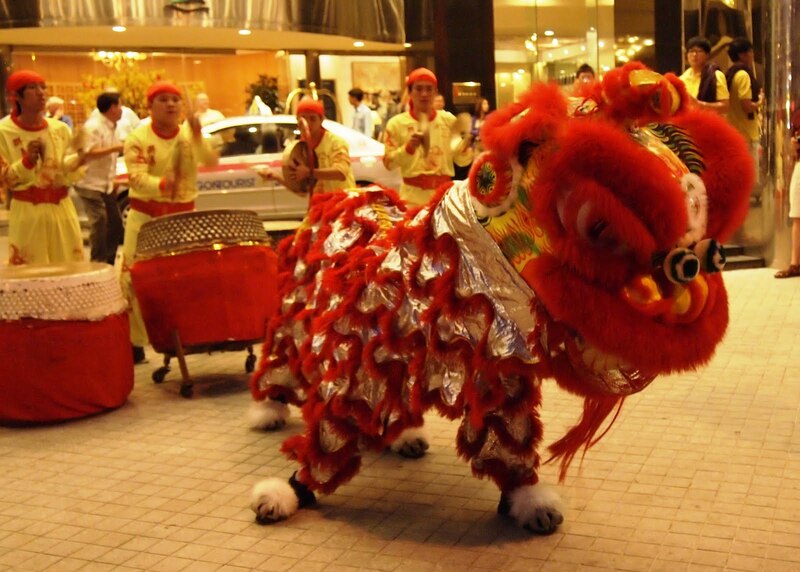 A lion dance is reenacted at the Caravelle Hotel to ward off evil spirits and bring in good business for the year. I intended on staying out until midnight to watch the big fireworks display, but I began to worry as the crowds got bigger and the street space smaller. Not knowing if I'd be able to find a ride back to my place and not wanting to be around drunk drivers, I headed back early and watched the show from the rooftop of my apartment. My view was a bit obstructed but there were a few other foreigners who had the same idea so I had some company. We watched the family next door prepare an alter on their patio and at the strike of midnight, they began lighting incense and praying. Pretty auspicious way to start the New Year, eh? The streets around the Opera House are not only decorated beautifully but were also blocked off to traffic. I knew most places would be closed so I decided to stick around my neighborhood the following day. I wandered the streets to find families gathered, eating, and having a good time outside their homes. There were plenty who were singing kareoke, a popular hobby around these parts. As soon as I made eye contact with one of the family members, they instantaneously greeted me and wished me a happy new year. Many of the families even motioned me over to share their beer with me. Today, I wandered an area close to mine to see similar scenes. One thing I saw a lot more of was street-side gambling. There were a few games being played in small circles of taxi drivers and market attendants. I'm not sure what they were playing, but some were using cards and others using a checkerboard like game. I even saw a couple kids doing it, throwing out bills that were probably lucky money they received from family members. I knew before coming here that Vietnamese people like to gamble. 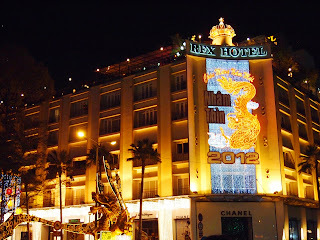 What I didn't know is that they believe if they win during Tet, they will have good luck gambling in the future year. Although this has been my first Tet experience, I can still sense the festive feeling in the air and observe the hospitality of the people. I read on the internet that the Vietnamese are intent on being friendly and generous on the first days of the New Year, as such kindness brings good fortune. Still, I find it hard to believe that it's a temporary thing, an act. Their warmth has made the past few weeks here an enjoyable time. And, I'm certain the next few weeks will be just as nice... and hopefully lucky.